An initiative by the Australian Sports Commission to increase the exposure and reach of women’s sport in Australian media. A Two Wave Total is a behind the scenes look at Australia’s elite female surfers and their bid for the 2012 ASP World Title. This program ensured that more Australians got to see wider coverage of exciting women’s surfing. Follow Australia’s leading female surfers as they chase glory on the Australian leg of the ASP Women’s World Championship Tour. Stephanie Gilmore, Sally Fitzgibbons, Laura Enever, Tyler Wright, Rebecca Woods and junior star Nikki van Dijk put it all on the line in front of their home fans at the Roxy Pro Gold Coast, Rip Curl Pro Bells Beach and Commonwealth Bank Beachley Classic in Sydney. 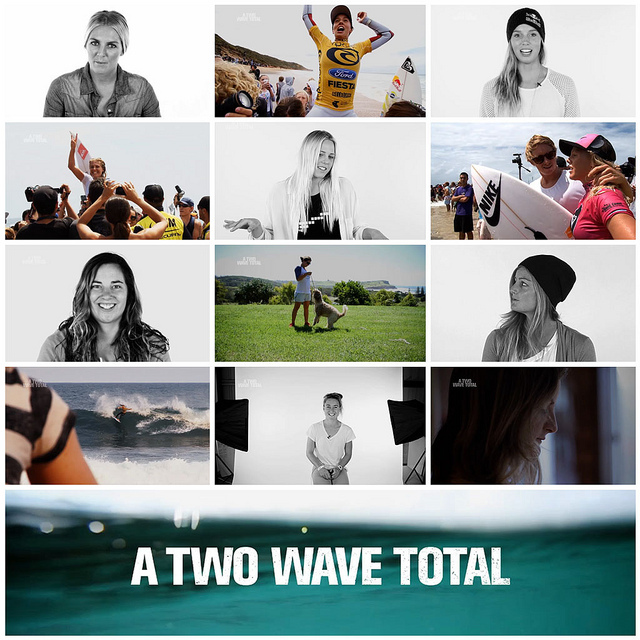 A Two Wave Total follows their progress on the Dream Tour as they not only take on each other but the planet’s best female surfers in their quest for surfing’s ultimate honour – the World Title. Funded by Surfing Australia & Australian Sports Commission. A Two Wave Total was the centre piece of a media strategy which has seen Surfing Australia become the model by which other Australian Sports media is judged. A Two Wave Total Was broadcasted nationally Sunday, July 1 2012, on Channel Nine to approximately 2 Million homes.